The widespread adoption of electronic court filing systems allow for easier and more efficient views of the rich data of probate proceedings. Wills Law on the Ground by Professor David Horton, published in the UCLA Law Review, highlights both the potential and some of the inherent limitations of empirical research in the law of wills. Wills law has been the battleground of formalists and functionalists over the last half century, with both sides bearing the banner of testator intent, but neither backing up their proposals or counterproposals with much hard data about which better achieves their common aim. Professor Horton culls data from probate files to disprove predictions of litigiousness and runaway probate costs that were projected to accompany a departure from strict formalism. At the same time, his study encounters the difficulty of assessing the measure of decedents' unstated goals. This Article outlines will doctrines and past empirical probate studies and probes a future when relaxes formalism will be finely tuned by empirical data to achieve majoritarian testator intent. 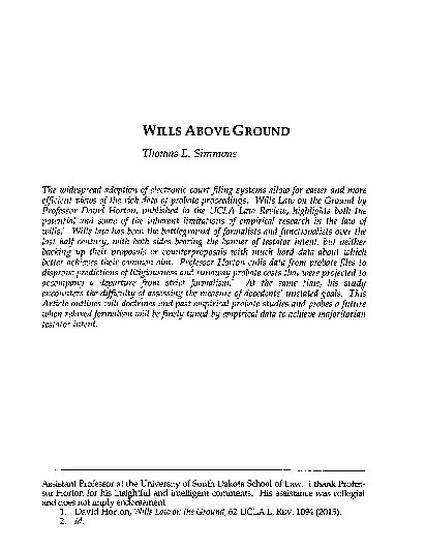 Thomas E. Simmons, Wills Above Ground, 23 Elder Law Journal 343 (2016).